Located next to the Palace on the same beautiful beach. Being in a privileged environment, the hotel offers a variety of activities on the beautiful beaches such as diving or fishing in the Pacific waters, non-motorized water sports, windsurf, sailing, snorkeling equipment, kayaks and other water activities, or you can go partake in the ecotourism in the volcanic areas. The four swimming pools (one with a wet bar), whirlpool bath, Children’s swimming pool, Free sun loungers, towels and parasols by pool, Sun terrace, Children’s playground and the kids mini-club for children ages 4-12 where the staff will keep your children occupied as well as they will make many new friends. The hotel has table tennis, volleyball, tennis court, and if your favorite sport is golf, the Four Seasons Golf Club has fantastic views over the sea and is close by. At the wellness center there is a gym, sauna, Jacuzzi and the “Renova Spa” gives you many options for treatments and massages. In the evening there is live music as well shows for your entertainment or you can dance the night away at the Pancha nightclub or the casino (drinks not included). “El Poblado” Street with boutique, kiosk, mini-market, souvenir & photo shop all there for your shopping pleasure. 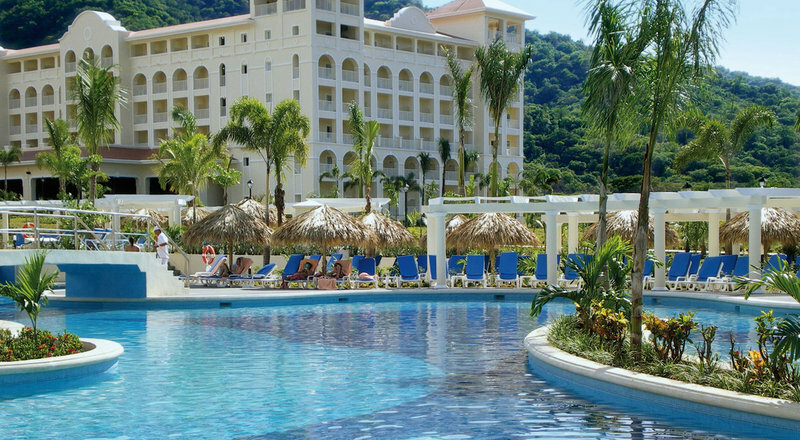 RIU Guanacaste features five restaurants and five bars, “Liberia” main restaurant (non-smoking) with terrace,”Furama” Asian restaurant, “La Toscana” Italian restaurant, “Tucán” Gourmet restaurant, “Ocotal” poolside restaurant/ grill and steakhouse, “Filadelfia” lobby bar, “Pura Vida” lounge bar, Sports bar, “La Plaza” bar, “Santa Cruz” poolside bar with swim-up bar. 701 guest rooms, Double rooms with: Wi-Fi (charges apply) free in the lobby, Ceiling fan, Minibar, Liquor dispenser, Satellite TV (flat screen), Electronic in-room safe (Laptop size 15″. Interior dimensions: H 20cm / 7.8 in x W 37.5 cm /14.7 in x D 34 cm / 13.3 in), Balcony or terrace, Inter-connecting rooms available. Family suites (2 bedrooms) with: 2 bedrooms, 2 bathrooms, bidet, Sofa bed. Suites with: Bathroom with hydromassage bathtub, shower cabin and bidet, integrated lounge area with 1 step between levels, with sofa, Dressing room. Whirlpool bath suites with:Bathroom with hydromassage bathtub, shower cabin and bidet, Integrated lounge area with 1 step between levels, with sofa, Dressing room, Whirlpool bath on upper terrace.